Tis the season to be watching absolutely nothing but holiday episodes of our favorite programs! During the holidays I'm hard pressed to watch anything that isn't tangentially related to Christmas. I don't know why, Christmas movies are my JAM during December. From Miracle on 34th St right after the Thanksgiving Day parade, to the annual Doctor Who Christmas special on Christmas day, I am all Christmas all the time. Now that I've laid out my credentials for you, I feel completely confident in naming the BEST Christmas special in the history of ever. I'm not talking about Christmas movies (thought White Christmas is the best) or original Christmas TV programs (that honor goes to The Year Without a Santa Claus which the epic song on the video above is from), I'm talking about the holiday episode of a regular TV show. Trust me on this, I'm a professional. Join me under the cut for the unveiling of the best Christmas special ever! This was a difficult choice, and it very nearly went to the beautiful claymation Christmas episode of Community, but it can't compare to the insanity that is an evil robot Santa. Yes, friends, I'm talking about the Futurama Christmas special, A Tale of Two Santas. It has everything you could want in a Christmas special. There's a deeply catchy song, there's drama and intrigue with a heartwarming ending... and a freakin' evil robot Santa! Futurama is continually one of the most clever, well done shows on TV. It suffered a death at the hands of Fox (who kills everything we love) only to enjoy a second zombie life on Cartoon Network's Adult Swim block of programming. It regained full life when Comedy Central bought it and started to make new episodes, which are thankfully just as funny as the earlier ones. For those not in the know, Futurama is a sci-fi comedy that follows Fry, a hapless delivery boy who accidentally travels to the future. He takes it relatively well, honestly. He joins a crew of hilarious misfits (such as the badass Leela and the meme-tastic Doctor Zoidberg) and they have various misadventures. Even if you haven't seen Futurama before, you've definitely seen Fry. He's the guy holding a fistful of dollars, demanding that you shut up and take his money. Futurama has spawned many, many memes and I love them for it. What makes this Christmas special better than the rest, you ask? Did you hear me mention the evil robot Santa? No, seriously. He's evil, he's a robot and he's Santa. He was built to judge whether people were naughty or nice, but his standards are too high and everyone is naughty, which means they must be eliminated with jaunty holiday-themed weaponry. Our hapless crew is always getting in his way and this time they actually trap him and decide to make Christmas a really jolly holiday like it used to be. 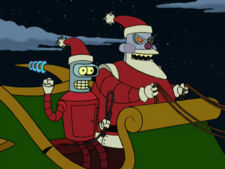 They pick another robot, the hilariously foulmouthed Bender, to take on the role of Santa and it breaks down from there. The episode features Futurama's award winning humor and use of puns (there is another holiday robot, KwanzaaBot, who bemoans the fact that he has to keep giving out books explaining what Kwanzaa is, for example), as well as a song that gets stuck in your head worse than any other Christmas earworm. The entire episode is so deeply and brilliantly wrong. It follows the Nightmare Before Christmas in that the person pretending to be Santa does a terrible job and Santa comes back to fix everything... except this time, Bender isn't bad ENOUGH and SantaBot breaks free and goes to make the holiday even WORSE. That is why A Tale of Two Santas is the best Christmas special ever. Don't agree with me? That's fine, I barely agree with myself most days. Leave a comment telling me what your favorite Christmas special is and maybe we can hash out a compromise.